Morning Pointe residents Thelma Keith, Vera Sachleben, Rebecca Brown, Gretta Mould, Sarah Hester, Business Office Director Taye Contreras, Executive Director Robin Jackson, Life Enrichment Director Christine Rivers, and Executive Director in Training Jonathan Lowery present the caps and knot blankets that they made for MaryEllen Locher's "Hats from the Heart" to Annual Fund Coordinator for CHI Memorial at the Joe and Virginia Schmissrauter Center for Cancer Support Karen Sloan (middle row, second from left). ? The residents of Morning Pointe of Hixson (TN) are passionate about giving back to the greater community. Each year, the assisted living and Alzheimer’s memory care community supports the CHI Memorial Foundation by donating fleece blankets hand-tied by the residents and caps hand-knitted by resident Vera Sachleben. Most recently, they donated 75 fleece blankets and 18 caps to MaryEllen Locher’s “Hats from the Heart,” a local initiative that provides hats and caps to patients at chemotherapy infusion centers in Chattanooga-area hospitals. 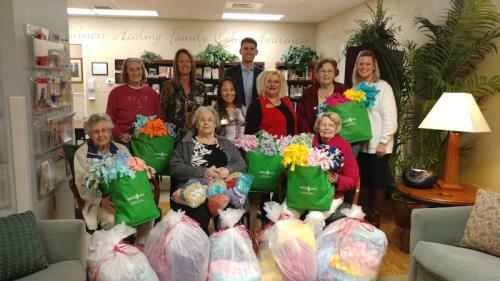 “The residents of Morning Pointe of Hixson will continue to show our support to cancer patients, warming both their heads and hearts, and we will be back again next year with more blankets and caps!” says Life Enrichment Director Christine Rivers. The residents of Morning Pointe of Hixson are always up to something! To follow their adventures, visit the Morning Pointe of Hixson homepage at www.morningpointe.com.